Most of us are already familiar with the fun and educational programming provided by PBS. Many of us grew up with Sesame Street and The Reading Rainbow right? Well, I am pleased as punch when I find my kids engrossed in PBS programming because I know they are likely learning while viewing. 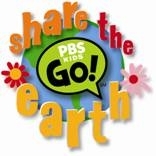 Well now PBS is participating in an entertaining, educational, and free Earth Day campaign! This is even better news for an eco conscious parent. The online content and programming are ADORABLE – and all free – and help instill a love of the environment and eco-conscious values in children and their families. Joining in the campaign is a great way for kids and families to start a dialogue about the importance of preserving the earth, while learning and having fun. day Earth Day at your house! -New and classic Earth-friendly episodes of popular PBS KIDS and PBS KIDS GO! shows that “take root” Wednesday, April 22 (check local listings), including CURIOUS GEORGE, ARTHUR, CYBERCHASE, SID THE SCIENCE KID, SUPER WHY!, CLIFFORD THE BIG RED DOG and more! I love PBS and I love NPR. You just can’t go wrong with either. They provide such useful informational programming. Thanks for the tip.